Like American neighborhoods everywhere, San Diego's Hillcrest has been shaped by the country's economic cycles, demographic changes, and periods of growth, decline, and resurgence. 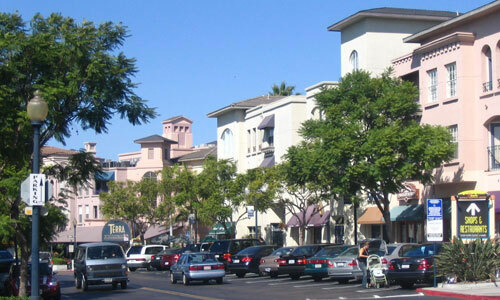 Nevertheless, the neighborhood's unique blend of setting, details, and residents has made Hillcrest a trendsetter and catalyst for change. Considered San Diego's most diverse, vibrant, and urbane neighborhood, Hillcrest has been a source of social, cultural, and political influence, especially for gays and lesbians. 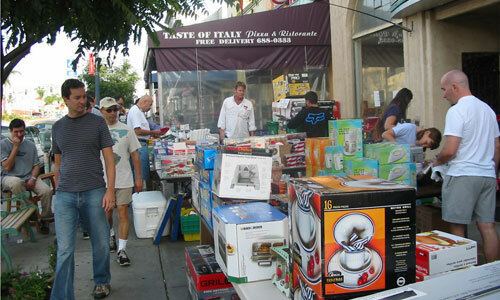 Given its diversity, pedestrian-friendly and village-like qualities, and other features, Hillcrest is recognized as one of APA's top 10 Great Neighborhoods for 2007. Uptown sidewalk scene. Courtesy of Mary Wright. From its beginning in 1907 when businessman William Whitson bought 40 acres from the former George Hill estate and development proceeded along the lines recommended in the 1908 San Diego Comprehensive Plan by John Nolen, the neighborhood has been a place where experimental ideas and practices have taken hold. Hillcrest was one of the places where the progressive designs of Arts and Crafts–influenced architect Irving Gill were built during the early 20th century. The neighborhood also has works by Hazel Waterman and Lillian Rice, among the first women to practice architecture in the U.S. It also was in Hillcrest where, in 1990, a closed Sears store became one of the country's first compact, pedestrian-oriented, mixed-use redevelopments. Involving more than 200,000 square feet, the Uptown District project attracted national attention as an early model of "smart growth" — where low-density, obsolete sites in suburban-like locations are redeveloped for higher density commercial, retail, residential, and community uses. San Diego's juxtaposition of mountains, mesas, valleys, canyons, coastal bluffs, and sandy beaches contributes to Hillcrest's distinct physical character, writes planning professor and author Gene Bunnell in Making Places Special. "We're on top of a hill," adds resident and Uptown Planners board member Andrew Towne, "with views of the [San Diego] Bay and Pacific Ocean." In addition to its topography and proximity to world-class attractions like Balboa Park and the San Diego Zoo, Hillcrest has a compact and pedestrian-oriented commercial district. The neighborhood put its stamp on the commercial area centered at University and Fifth avenues after a two-year effort — led by the Uptown Community Planning Committee — convinced the San Diego city council to establish city's first business improvement district there. Today more than 1,200 businesses belong to the district, making it a major center of commerce for not just the neighborhood, but the entire city. View of Laurel Street and El Prado by park. Courtesy of Mary Wright. During the 1970s and 1980s, after more than a decade of serious economic decline, Hillcrest underwent demographic changes and became the center of the city's gay and lesbian community. The new residents were instrumental to Hillcrest's economic recovery, as was Joyce Beers, widely known as the neighborhood's "beloved daughter." A champion for public transit and neighborhood revitalization, she helped bring together different community interests to focus on common goals. Hillcrest activism and trendsetting also came into play when residents sought to build the Vermont Street pedestrian "art bridge" across Washington Street in 1995. According to area planner Michael Stepner, highway officials closed the termite-damaged bridge in 1979 and refused to replace it because it was not part of a highway or motor vehicle improvement project. Residents refused to acquiesce. Stepner said the community turned to the San Diego Commission for Arts and Culture for funds to build a new pedestrian bridge as a "work of public art." The successful strategy also led the city to reconsider its approach to pedestrians, Stepner said. 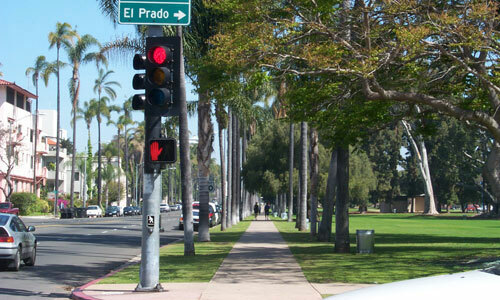 Today San Diego has a separate Pedestrian Master Plan that guides and prioritizes scores of projects and improvements for walkers throughout the city. As Hillcrest residents recognize their neighborhood's centennial anniversary in 2007, they have much to celebrate in their community's past accomplishments and its promising future. Street view. Courtesy of Mary Wright.